We can guess this little girl with a pet lamb may have been called Agnes, by association with the saint, or it’s simply an allusion to the little girl’s innocence. Although she’s placed in a rural setting, she undoubtedly hailed from a wealthy Amsterdam family, most likely mercantile. Gold bracelets and precious ring aside, the detailed lace on her dress is as much a clue to her family’s wealth as the gold. Lace was often even more expensive than jewellery, and here the lacework on her dress is a phenomenally fine and careful rendition of the actual garment. Private collection, France, until 2018. The portrait can be dated by costume to circa 1640 – 1645. Our young girl wears a white bodice with an intricately rendered double row of lace down the front, echoed at her neckline, where the two rows of lace line the round-shoulder collar. The skirt is raised all around to reveal her embroidered underskirt, another sign that we are looking at a young girl and not a boy. She also bears compelling comparison on the basis of costume and setting with the artist’s portraits of Marinus and Clara Alewijn, painted in 1644, now in the Rijksmuseum, in which the children are likewise depicted as pastoral figures. 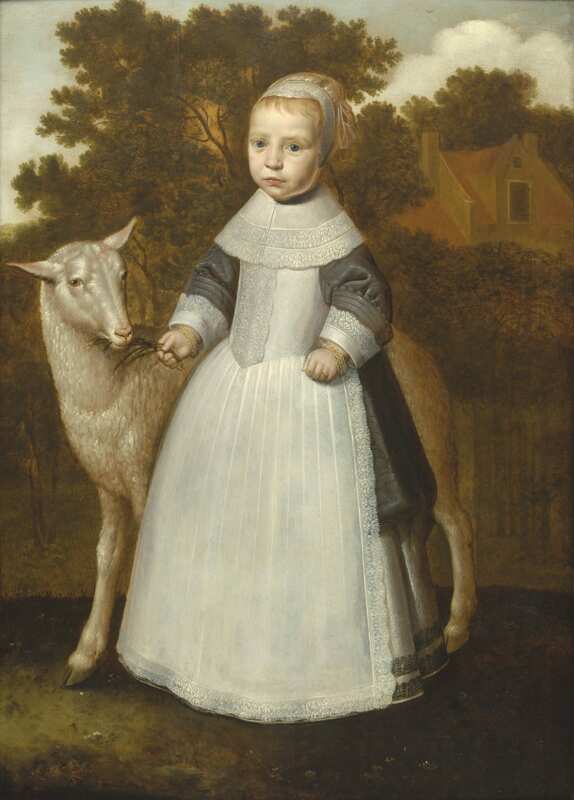 Accessories were often used inventively in children’s portraiture of the time, and the pastoral setting reflects the growing interest in rural life evident in Dutch literature and art from the beginning of the seventeenth century, at a time when the cities themselves flourished as mercantile hot spots. It is likely that the sitter’s family wanted to express an idealisation of outdoor life and pursuits, in contrast to their actual situation as wealthy town-dwellers. The lamb of course further serves to emphasise the virtuous innocence of the child. The woodland cottage beyond is far from the actual reality of her life. Here, she emerges from the scene as a miniature shepherdess guarding her lamb. Dirk Santvoort was the son of the painter Dirck Pietersz. Bontepaert under whom he and his elder brother (the landscape painter Pieter Pietersz. Santvoort) almost certainly studied. In 1636 he became a master of the Guild of Saint Luke in Amsterdam. He was soon to become one of the leading portrait painters in Amsterdam during the mid-17th century, particularly specialising in the portraiture of children. Santvoort’s earliest signed portrait of a child is his portrayal of Willem van Loon in the Museum van Loon, Amsterdam, dated 1636, and there are no dated pictures by the artist after 1645. J. B. Bedaux & R. Ekkart, Pride and Joy: Children’s Portraits in the Netherlands 1500-1700, Ludion Press 2000, p.79. Young boys were also dressed in skirts and so it can sometimes be difficult to tell whether we are looking at a boy or a girl. J. B. Bedaux & R. Ekkart, Pride and Joy: Children’s Portraits in the Netherlands 1500-1700, Ludion Press 2000, p.134 & 160.